Police have put two people in jail, as part of the operation codenamed "Specialist", after the seizure of 3 remote-controlled explosives. Maksim Hekurani, 26, and Nikola Roxhe, 21, both resident in Vlora, are arrested while criminal proceeding started for the citizen A.K., 42, resident in Tirana. Specialists of the Sector Against Illicit Trafficking and Narcotics, at the Local Police Directorate of Elbasan, following a long-standing proactive investigation with special investigation methods, finalized successfully the police operation codenamed "SPECIALISTI"
Also, is executed the detention order of 13.07.2017 against the citizen Flamur Fejza, a 38-year-old resident of Elbasan who remains arrested in DVP Tirana for the criminal offense of "Production and Sale of Narcotics" provided by the Article 283 of the Criminal Code. Also, criminal proceedings have been initiated against A.K. citizen, 42, resident in Tirana. Their arrest was carried out in the framework of the criminal procedure with special investigation methods, after on 13.07.2017, around 15:30, in cooperation with the officers of the Special Operations Force of the State Police Directorate, police control is held on a car service rented by the citizen Maksim Hekurani, in the city of Vlora. 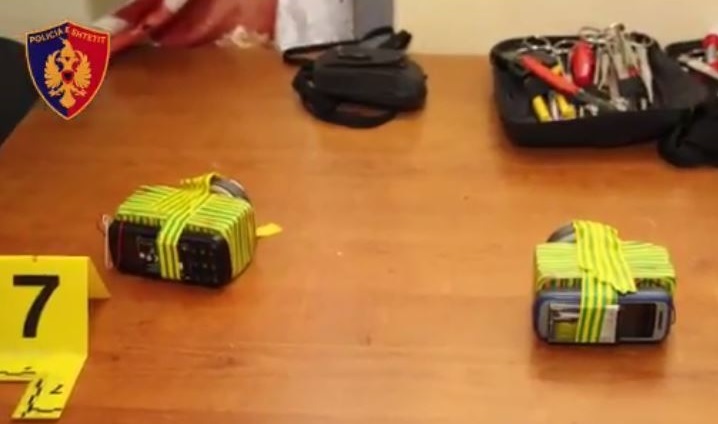 During the control exercised by the police, three (three) remote explosive mines (mines with remote control) were found in these facilities, equipped with a mobile phone battery, charging thread, and magnets.